If there's one thing that I like about Bing's iPhone application is the interface for image search. 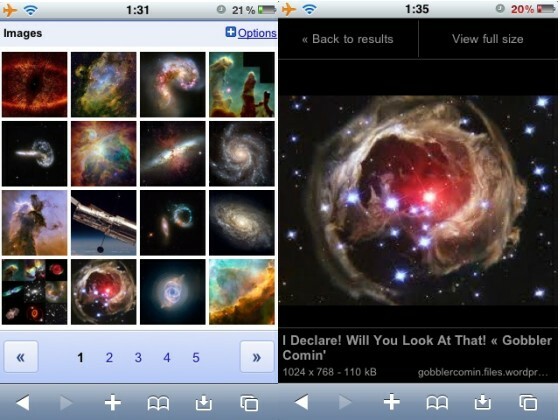 Google borrowed some ideas from Bing and improved the mobile version of Google Image Search for iPhone and Android. "In the redesign of Google Image Search for mobile, available today for iPhone 3.0+ and Android 2.1 devices, we focused on making it easy to quickly see as many image thumbnails as possible. The thumbnails are square to maximize the number of images we can get on the screen at one time so you can scan them quickly. You can swipe to see the next or previous page of results, or tap the large, stationary 'Next' and 'Previous' page buttons. We optimized for speed so that the images appear quickly when you browse," explains Google. Google Image Search's interface for iPhone and Android is much better than the desktop interface, which really needs an update. The Sideshow extension for Chrome enhances Google Image Search and other photo sites, but it would be better if Google implemented some of its feature. Just noticed this this morning. Great new setup, way more fluid and smooth, but it keeps swiching back to the old setup on some images, kind of annoying. Too bad it doesn't work on older versions of Android.